Slack founders are taking marketing lessons from Steve Jobs. 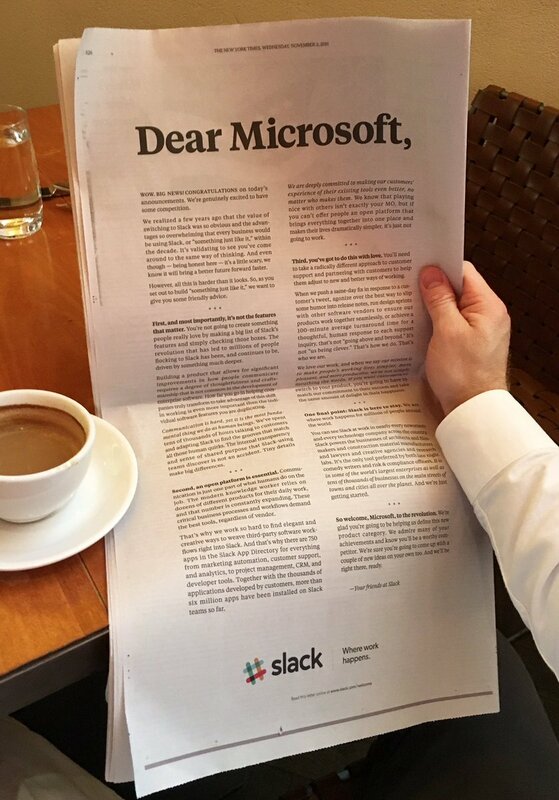 The workplace communication company took out a full-page ad in today's New York Times, ahead of Microsoft's Office event which will kick off at 11 a.m. EST. It has been reported that Microsoft will likely reveal a Slack competitor, Microsoft Teams, during said event. The ad is reminiscent of Apple's 1981 'Seriously' ad, from Chiat\Day, which welcomed IBM to personal computing by making it clear all the work that Apple had already done to dominate the space. With its ad Slack uses a similarly condescending tone, laying out all that it has learned since launching three years ago. Slack created the ad in-house, according to a spokeswoman. The company worked with creative shop redpepper on previous ads. Slack co-founder and CEO Stewart Butterfield posted a photo (see above) of himself reading the ad on Twitter. "That feeling when you think 'we should buy a full page in the Times and publish an open letter,' and then you do," Buttersfield wrote. Wow. Big news! Congratulations on today's announcements. We're genuinely excited to have some competition. We realized a few years ago that the value of switching to Slack was so obvious and the advantages so overwhelming that every business would be using Slack, or "something just like it," within the decade. It's validating to see you've come around to the same way of thinking. And even though — being honest here — it's a little scary, we know it will bring a better future forward faster. However, all this is harder than it looks. So, as you set out to build "something just like it," we want to give you some friendly advice. First, and most importantly, it's not the features that matter. You're not going to create something people really love by making a big list of Slack's features and simply checking those boxes. The revolution that has led to millions of people flocking to Slack has been, and continues to be, driven by something much deeper. Communication is hard, yet it is the most fundamental thing we do as human beings. We've spent tens of thousands of hours talking to customers and adapting Slack to find the grooves that match all those human quirks. The internal transparency and sense of shared purpose that Slack-using teams discover is not an accident. Tiny details make big differences. That's why we work so hard to find elegant and creative ways to weave third-party software workflows right into Slack. And that's why there are 750 apps in the Slack App Directory for everything from marketing automation, customer support, and analytics, to project management, CRM, and developer tools. Together with the thousands of applications developed by customers, more than six million apps have been installed on Slack teams so far. We are deeply committed to making our customers' experience of their existing tools even better, no matter who makes them. We know that playing nice with others isn't exactly your MO, but if you can't offer people an open platform that brings everything together into one place and makes their lives dramatically simpler, it's just not going to work.